Tom Paine thought of himself as a "gardener of ideas". Thomas Paine's moral and political thought raises the question, "How can we become a more self-governing society?" Paine's vision of self-governance can be seen in his moral and political thought which is relevant today to each and all. Self-governing individuals are necessary to have a self-governing society. By self governing is meant the willingness of individuals to consciously choose and hold to principles or an ideal yet flexibly apply that ideal in diverse situations. Thomas Paine said "My country is the world and my religion is to do good." For Paine the source of the good went beyond a commitment to world citizenship. "The true deist has but one Deity; and his religion consists in contemplating the power, wisdom, and benignity of the Deity in his works, and in endeavoring to imitate him in every thing moral, scientifical, and mechanical" (A of R p.84). James Tepfer describes this as "our living awareness of the Infinite Presence. "(Tepfer, p.1) Thus, Paine felt that the moral duty of man consists in imitating the moral and beneficience of God manifested in Man and Nature's laws. This was the ever renewing source of man's reason. Paine believed that man can infuse and draw out the good of fellow men in society in theatres of political participation by using his conscience and his reason. Society arose because men needed one another, and is a workshop for its citizens to experiment and self-correct. "As nature created him for social life, she fitted him for the station she intended. In all cases she made his natural wants greater than his individual powers"(R of M pg. 187) ; thus the need for a natural reciprocity recognizing our moral and societal interdependence. It is through our sociability that we can expand our perspectives to greater mutual understanding and more inclusive, universal thought. In the process of reasoning with each other, we can view our own limitations, those of others, and correct our errors in thinking. In order to let happiness blossom in society, men need the right to express their conscience. Self-evident human rights such as freedom of conscience and religion are the foundations of equality. Paine felt that human rights get translated into shared natural rights through making claims to be tested by reason. In order to help enforce these rights, then civil and legal rights by government create a civil society for citizens to manifest their political claims. Each right has a corresponding duty. Paine said our first duty is to be kind to others. Paine also said that a person's corresponding duty is to allow the same rights to others as we allow ourselves. From this basis we can use our abilities to promote mutual understanding. These expanding circles of reciprocal duties and rights weave a tapestry, built on democratic norms, of liberty in the context of societal interdependence. The right of commerce was seen as transforming the mind-set of feudal, dependent relations between men and their government. It helped transform subjects into confident citizens. Trade was viewed not as laissez-faire, but in a web of social interdependence. It was seen as a major modality for individuals to use their active minds to develop better mutual understanding of others interests in society. While aware that too much indulgence in commerce could lead to the decline of spirit and patriotism, making reason subservient to commercial interests, Paine believed commerce was an important element in a strong self-governing society of expanding universal happiness. Paine felt that man would use his religion of reason to place commerce within a broader quest for lifelong education in the arts, sciences, engineering, and philosophy in order to progress to a universal society and universal happiness. For Paine, knowledge starts with the Divine. "It is from the study of the true theology that all our knowledge of science is derived; and it is from that knowledge that all the arts have originated." (A of R p.76) Thus, the arts and sciences should illuminate man's highest spirit of reason in its motives and applications such that it does not have to be concentrated solely in pursuit of commercial interests. Art, science, and commercial enterprise can be placed in service to humanity and universal happiness. Thus, men and women must discover those laws operating in society which will create a greater harmony of overall interests. Democratic communities will have to choose to redistribute some minimal baseline of societal resources to those at least most vulnerable not as charity, but as a right in the name of social harmony. Paine's ideal of a self-governing society is encapsulated as "The more perfect civilization is, the less occasion has it for government, because the more does it regulate its own affairs and govern it." (Rights of Man p. 189 Appleby) In this context, government was not to be glorified, but is simply needed as a contingent, malleable solution to restrain our vices and to restore some degree of harmony and social justice through minimal social welfare to each and all. Raghavan Iyer writes in Parapolitics, (p. 290-291) "No man can fulfill his many wants except in the company of others; because ofthe collective wants of human beings, there is validity and value to human societies. But unfortunately, men want to bequeath the burden of finding fulfillment to some external authority. When embodied in imperfect men, whatever the laws, systems, or government, this will gradually license every abomination" . Paine wrote that democratic republics would be judged by its citizens through a standard of res publica or a common good. The "common good" involves a mental posture taken by citizens in their deliberations where they account for yet transcend partial interests to look at the good for each and all in their decisions. The common good and a democratic government are thus posited as broad criteria for making government indirectly self governing because representative government is "owned" by citizens, and citizens are free to appraise the outcomes of their government. Fair elections, clear laws impartially enforced, clear performance accountability, and a transparent appraisal of governmental outcomes were qualities of a democratic republic. Since all human institutions can become deformed over time, Paine recommended that each generation should renew their associations in developing new written Constitutions appropriate to their times. As individuals become more adept at using reason to becoming more self-governing, collectively they would be able to self-organize, trust each other, and need less government. Thus, the spirit of communes, collectives, and self-organization can be seen as microcosmic experiments in direct self-governance, providing prospects and possibilities for a society of the future and a more self-governing society. Using Paine's moral and political thought, how can we assess our contemporary politics? Morally, Paine's concept of reason has been dethroned. Paine's idea of the use of reason toward the common good has been deformed in the service of pursuing narrowly defined, separative, and overly concretized goals where commercial interests equate with public purposes. An overly reductionistic natural and social science has supported this goal denying the spirit of natural moral reasoning for the common good. By denying natural law associated with empirical facts, the transcendent infusing the immanent, the connection between individual conscience, reason, and will is weakened. This condition results in greater citizen passivity in moral spirit and lessening of the creative imagination. Political consciousness is narrowed and interests become partitioned. 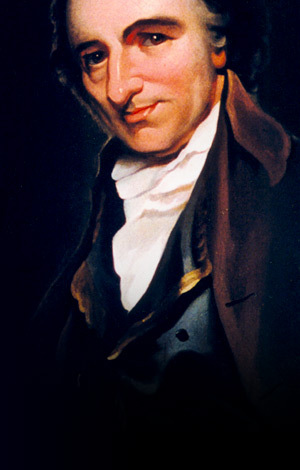 As the facts of human interdependence and its apparent complexities overwhelm individuals and groups, faith and reason, fear and fearlessness become confused, and simplistic political and religious ideologies become the basis for action without incorporating the full range of facts or humanity in the situation-the inverse of Paine's reason. Relative to Paine's view of society and government, Raghavan Iyer in Parapolitics (p.183) warns "there has been a dangerous transition from the idea of a government of limited powers over citizens with inalienable rights to the idea of the unlimited sovereignty and the material welfare of the majority. It is an easy step from here to the perilous position reached by most democracies today, in which individual liberties are violated in the name of national security and prestige at home and abroad, in which the mute and meek are often sacrificed at the alters of public utility and political necessity." How can we regenerate our politics using Painite principles? First and foremost, we must think back to the ideals of the Founding Fathers: we need more fearless, principled, disciplined thinking, self-governing individuals. As citizens debunk media images and mindless conventionality, they will recognize that societal pain is based on faulty thinking. They will continue to question and search for some deeper principles as a quest of life long learning. As individuals, we must restore natural reason in our lives. The centrality of a Painite form of reason will regain respect over the "jockeying" of interests and motives for personal gain in vogue in politics. The great spiritual traditions of mankind, the exemplified principles of a Gandhi, King or of Paine, and the growth of reverential ecological thinking-a testament to Paine's reverence for God discernable in Nature's laws --are some of the sources now available for individuals for freely choosing principles to live by. With an increasingly recognition of our global moral and societal interdependence and imbalance in global resource utilization, consuming less so others may live will be an example of self-governance in the near future, reflecting the Golden Rule found in universal religions and philosophies. Second, the American "system" must be reasoned anew in relation to the universal American Dream. Glasnost and perestroika (openness and restructuring) must occur to curb excess governmental (especially executive branch) power and concentration of media. We must move from a propertied to a consociated democracy. New constitutions of sustainability must be adapted by the people ranging in scale from neighborhood, watershed, regional, and national levels with the aim of more just citizen representation and conflict resolution. Larger units and smaller units of government must have a mutual "veto" power and negotiate solutions that work for both the larger good and particular needs in a situation. Third, each individual deserves minimal dignity and a minimal economic base to pursue their natural rights. Like Paine and Edward Bellamy one hundred years ago, some form of guaranteed minimal annual income ought to be adopted for each citizen, regardless of wealth or other distinctions. This proposal can create a universal basis for enhancing individual liberty and choice while attending to those most vulnerable. The proposal would also provide more flexibility for citizens and families to share and pool resources on a more communal basis to accomplish goals in many phases of their life. Individuals can reallocate time, energy, and commitments in various areas of life as flexible work schedules and the growth of self-initiated communes can allow for a greater diversity of the expression of human life and a more universal society. Fourth, education should be accessible to all, creatively integrating theory and practice, including the head, the hands, and the heart, so citizens gain in their ability to think and apply their thoughts constructively so to gain confidence as citizens. Half a school day should be devoted to a service work project where subjects can be addressed on a practical basis as well. Finally, Paine conceived of autonomous democratic nation-states forming alliances of mutual aid. Mikhail Gorbachev has said that we ought to have a balancing of interests, not a balancing of power on the global stage. Using Paine's criteria of recognition that moral, societal, and economic interdependence requires mutual aid, affluent nations should allow less affluent societies greater access to the world's resources (and their own) as a matter of right, while all share in the great arts, sciences, philosophies, and wisdoms of humanity in Paine's universal society. Paine viewed unity at the political level, above tribe and clan, as centered in a secular nation-state. Nation-states represent unique needs and traditions, should possess sovereignty to internalize their own environmental and social costs of their actions and police their borders. Nations should also democratize and, if needed, radically devolve power to sub-regions with cultural and economic distinctiveness. Military and private arms trafficking, as Paine suggested, should be radically scaled down and made more transparent. Globally, internationalization, with the primacy of nation-state alliances, is a major alternative to the trends of corporate economic globalization. In the myth of a "flat" world of economic globalization, where the world is made safe and frictionless for capital expansion, public policies are pursued at the great risk of disenfranchising people from their societies, their livelihoods, and dividing peoples in nation-states into haves and have-not under unaccountable institutions. Citizens and nations do not vote for corporate influenced governmental-military-industrial-media alliances and trade agreements which establish "the rules of the game" subtly conditioning the thinking of the masses. Paine believed without voting through a democratic method, members of a nation become slaves to someone else; thus disenfranchising them as citizens. Currently, even with the existence of a multitude of humanitarian non-governmental organizations, citizens and their nations on the globe do not have any legitimate, democratic law-making forum to legislate global rules of trade, environment, health, safety, or labor standards. An emerging people's global parliament, composed of associations of peoples, must be recognized as a first step toward a global democracy. While Paine advocated private enterprise complete freedom from government control, he did argue for abolishing charters for cities. Looking at Paine's reasoning and his overall view of universal society, I believe today he would advocate abolishing charters for large, public or private multinational corporations which give special privileges and concentration of economic and political power to the minority over the majority. All of these proposals are intended to illustrate fresh directions in the aim of establishing a Republic of Conscience—a natural extension of the spirit and practice embodied in the moral and political thought and life of Thomas Paine. "We have it in our power to begin the world all over again." "Tom Paine: Lover of Deity and Man" James Tepfer, paper 2006.